Running a successful business should be your ultimate goal, and offering coupons to your customers is a key aspect of strengthening sales. However, it’s important to also devise a plan of action – without one, you could essentially hamstring your overall campaign. By harnessing the power of Sell Media (and elements such as the Discount Codes extension), you can offer digital discount codes to your customers, all managed from a dedicated admin panel on the WordPress back end. In this post, we’ll firstly explain why offering coupons can be a stellar way to increase sales, then take a look at both the Sell Media plugin and the Discount Codes extension. Finally, we’ll discuss how you can leverage the solution to fit into your overall strategy. While you’re almost always looking to improve your sales figures, there are plenty of store owners who shun the use of coupons. On the surface, it’s easy to assume that money is made simply from increasing prices, not reducing them. In fact, the numbers tell a different story – approximately 53% of Americans shop only during sales or when using coupons. It means there’s a huge number of potential customers you’re missing out on by not offering them a chance to save money. Obtaining them is quick. From beginning to end, the process of securing and using a digital coupon is often a simple case of finding a website, copying the relevant code, and pasting it into the checkout field. They’re easy for prospective customers to use. There’s no clipping coupons out of the newspaper and driving to the store here. Customers can use your discount codes immediately, which encourages impulse buys. They attract a young audience. Millennials are the most likely group to either return to a retailer website, brand website, or search engine to find coupons. They enable you to undercut the competition. Deploying your own coupon campaign in response to a competitor’s sale through your site and social media channels can be achieved in rapid time. Coupon campaigns can be easily tracked. Since creating, distributing, and using coupons is an all-digital affair, gathering and analyzing campaign data is a breeze. If you hadn’t considered coupons as a way to increase sales before, you should now be chomping at the bit to create you own campaign. Let’s take a look at the tools that can help – our Sell Media plugin and Discount Codes extension. In order to offer discount codes on your WordPress website, you’ll firstly need a plugin that will help you sell your photos online, without a middleman, directly from your WordPress dashboard. 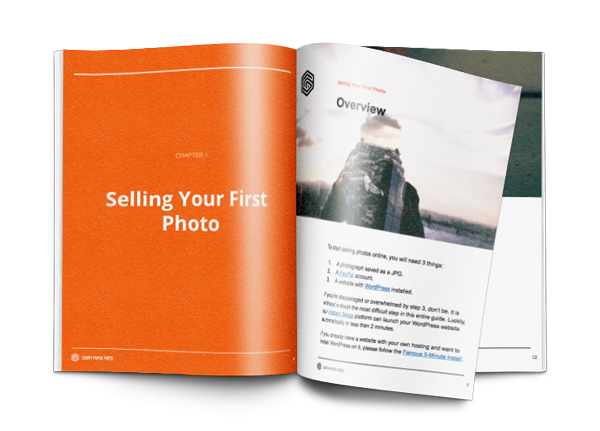 Sell Media is a free solution that enables you to create your own photography site for selling your work, create and administer licenses, and accept payments via all manner of gateways – including PayPal out of the box. Sell Media is easy to use, and its functionality can be enhanced via numerous extensions, offering you a complete solution for selling your work online. To offer coupons to your customers, you’ll also need the Discount Codes extension, which offers store owners the ability to run an infinite number of campaigns. This enables you to set either percentage discounts or a flat amount, time restrictions to help create a sense of urgency (perfect for the holiday season! ), and restrictions on the number of uses for each coupon. Just like Sell Media itself, it’s simple to use, but offers a wealth of functionality. Let’s take a look at how you can leverage it for your own coupon campaigns. Once you’ve purchased a Graph Paper Press subscription, and installed and activated both Sell Media and the Discount Codes extension, you’re ready to rock and roll. While getting to grips with both of them is a piece of cake, using them optimally is a little more complex. Let’s take a look at three ways the Discount Codes extension can help your sales strategy. The ability to add time restrictions to your discount codes offers you a wonderful chance to create a sense of urgency, especially around the holidays. However, you can expand upon this at any point during the year by offering discounts to new customers only. This element of scarcity forces consumers to take action immediately, and not overthink the process. Adding urgency to your coupon campaigns is a tried and trusted technique to maximize sales, no matter who your customer is. Due to being digitally distributed, the Discount Codes extension offers much more flexibility than the traditional, physical coupon route. It means you can offer multiple campaigns targeted at different customer bases, without any additional effort. For example, you could reward your most loyal customers by offering a flat rate discount on your older products, while new customers can take advantage of a percentage discount on your latest and greatest offering. What’s more, you could also generate a buzz on social media with a time limited exclusive offer, which enables you to further the reach of your products, and potentially increase your long-term customer base to boot. With physical coupons, it’s often hard to enable multiple uses of them simply because it’s more difficult to administer. However, with the Discount Codes extension, you’re able to restrict how many times a coupon is used directly from your Settings screen. It’s a simple feature that can offer a creative way to keep customers spending and returning for more – especially when mixing and matching other aspects of the extension’s functionality. For example, you could offer a 25% discount on any product in your range, time-limited to the current holiday season, but with a maximum of two uses. While some sellers may baulk at what appears to be giving your products away (twice! ), the enticing number of uses you’re offering could cause a new customer to make a purchase where they otherwise may not have. In a nutshell, the Sell Media Discount Codes extension enables you to think outside the box with regard to your sales campaigns and coupon code strategy, which will ultimately pay off in increased profits. Not understanding how digital coupon codes can fit into your overall business strategy could severely limit your bottom line. However, with a well-considered strategy in place — along with the use of Sell Media and the Discount Code extension— your business can potentially boom. Promoting action through urgency and scarcity. Enabling you to offer optimized multiple campaigns based on your customer base. Increasing your number of returning customers by allowing multiple uses of your coupons. How will Sell Media enhance your coupon strategy? Let us know in the comments section below! This entry was posted in Blog, Tutorials and tagged coupons, sell media. Bookmark the permalink.